Home » Music Reviews » JINTA-LA-MVTA – Look for Them Next Time! JINTA-LA-MVTA – Look for Them Next Time! JINTA-LA-MVTA PERFORMED AT JOE’S PUB! Don’t Miss This Group Next They Are in New York City! 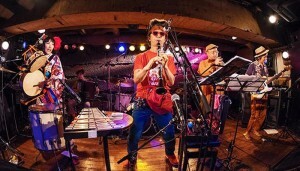 THE Japanese Klezmer Quartet that might be just as joyous as a homegrown, New York City, Jewish Klezmer Band! The First International Festival of Jewish Performing Arts began with a blast last night at Winter Garden at Brookfield Place with an hour and a half burst of merry music makers at a venue that, if you managed to get there early, gave you an opportunity to shop and eat before the concert, which couldn’t hurt. The entire Winter Garden at Brookfield Place was packed. A beaming and jubilant Zalman Mlotek, The Godfather of Yiddish Culture, and the Klezmatics, who since 1985 have taken one of the wildest approaches to the traditional dance music of Eastern European Jews, were their usually exuberant selves. People, young, middle-aged and older, were actually dancing in the aisles. What were they celebrating? That the century old National Yiddish Theater Folksbiene has finally stopped being Wandering Jews and have found a home at the beautiful Museum of Jewish Heritage at 36 Battery Place. Mazel Tov. Jewish Dance music is incredibly joyful, which always amazes me, inasmuch as it comes from people who have suffered so often and so much. Groups from all over the world let the audience sample what to expect from them at their individual concerts later this week. Eleanor Reissa, New York’s sexiest Jewess, warbled a few Yiddish torch songs, showing that at least one Jewish woman is interested in doing it. The biggest surprise of the evening was JINTA-LA-MVTA, a quartet from Japan whose explosive melodic happiness had the crowd jumping to its feet. They got me going when they played, among other great tunes, Dave Tarras’s Neue Sher. The sher is a Jewish version of a square dance that I remember my aunts and uncle’s dancing at wedding. The all-virtuoso quartet features Wataru Okuma on a magical clarinet; Miwazo Kogure on chindon (whatever that is) and percussion (I love the way she hops around! ); Naoki Hishinuma on a deep, brilliant tuba and Marié Abe connecting them all together on accordion. The group founded in 2004 by Ohkuma Wataru, clarinetist and bandleader of the groundbreaking Japanese experimental folk band Cicala Mvta and his partner and drummer Kogure Miwazo. Ohkuma’s interest in Klezmer music began in the late 80s. He was one of the first Japanese artists who listened to and played the genre. He has a repertoire of dozens of Klezmer tunes through his distinct perspective, setting him apart among non-Jewish klezmer musicians. 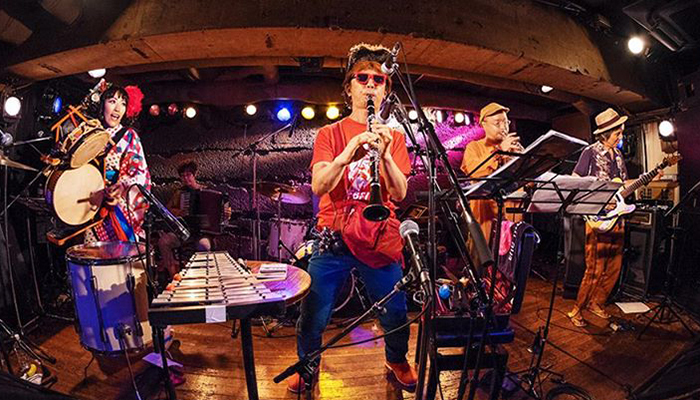 Considered as one of the few Klezmer experts in Japan, he has also penned various pieces on Klezmer and Japanese liner notes of Klezmatics and Frank London, which makes him family – mishpocha. . Since the Great Northeast Japan Earthquake and the subsequent nuclear crises in 2011, the band started to perform not only on club stages and festivals but also at anti-nuclear protests and demonstrations on the streets of Tokyo, attracting a new and wide range of audiences and fans. Look for them when they are next performing here in NYC.